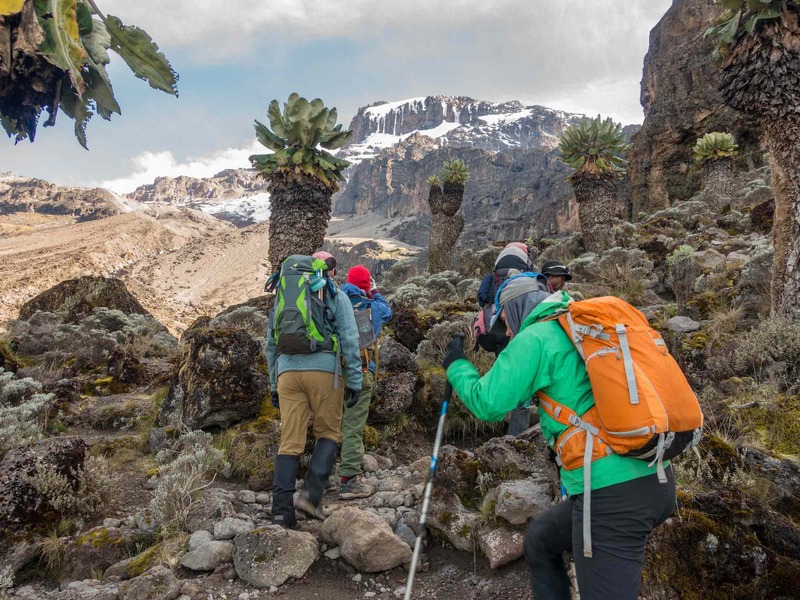 On Day 4 we had walked a bit over ten kilometers on our most demanding day so far. This day would see us scale back on the distance by almost half – and yet it would still be a fairly demanding day in its own way since there are two steep uphills involved – the first at the beginning of the day and the other at the very end as you walk the switchback trail up to Karanga campsite on the top of the ridge. That is when I hit the max 140 bpm you see in the stats below! 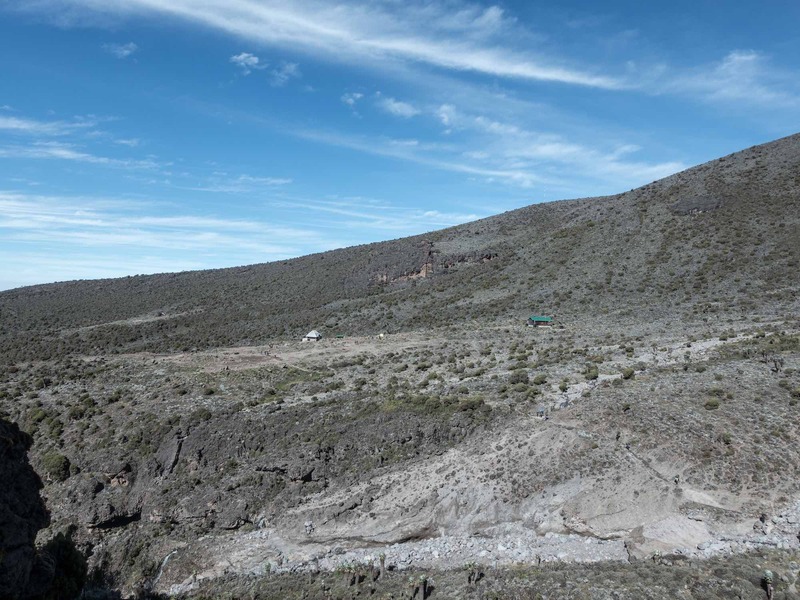 When it was all over we were only 50 meters higher than we had been at Barranco! 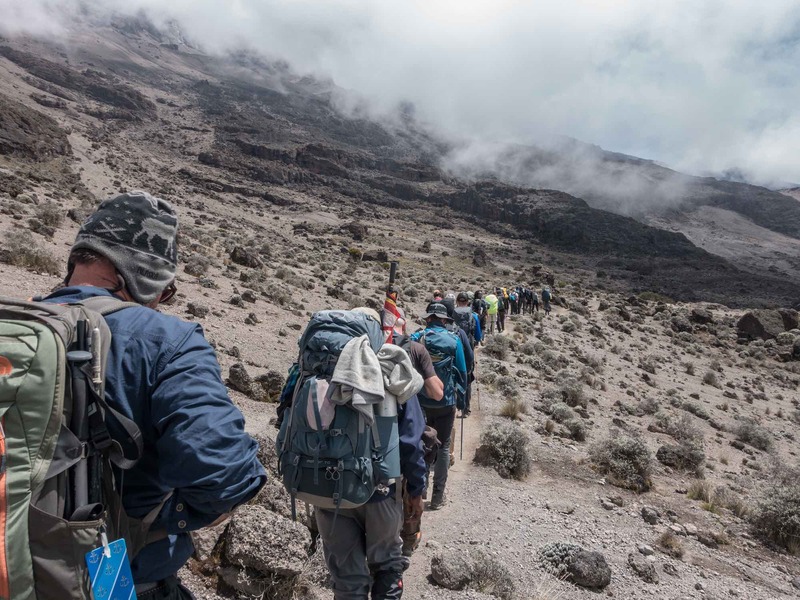 It should be noted that this is where some itineraries (see here for an example) save a day by continuing on to the Barafu campsite, another 2:30 worth of walking and with a demanding training load of its own. Our extra day on the mountain before our summit attempt is at least one of the factors that explains why all five of us made it up. 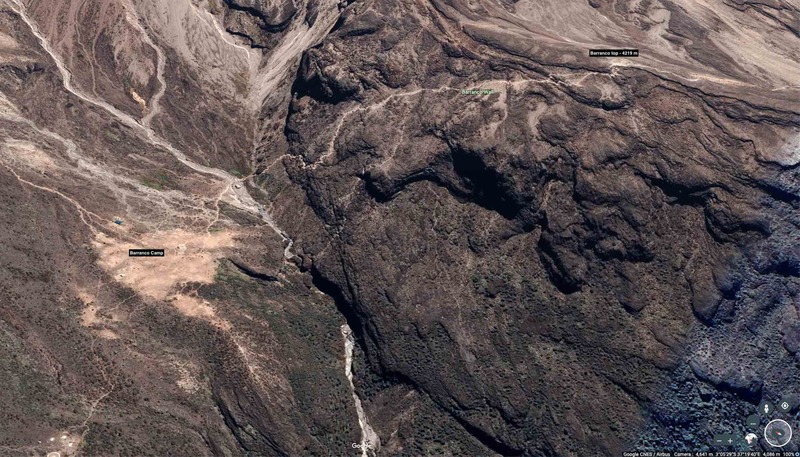 The satellite image above gives an overview of the day’s route from Barranco camp to Karanga. 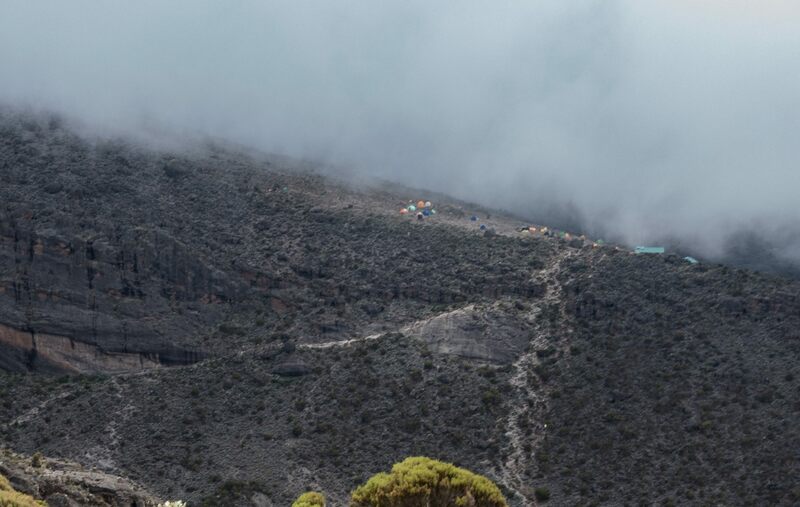 The next day’s campsite, Barafu at 4600 meters, is visible on the right-hand side of the image. The day starts with a five-minute walk down to and over the stream flowing down the Barranco ravine. That is when the fun begins! 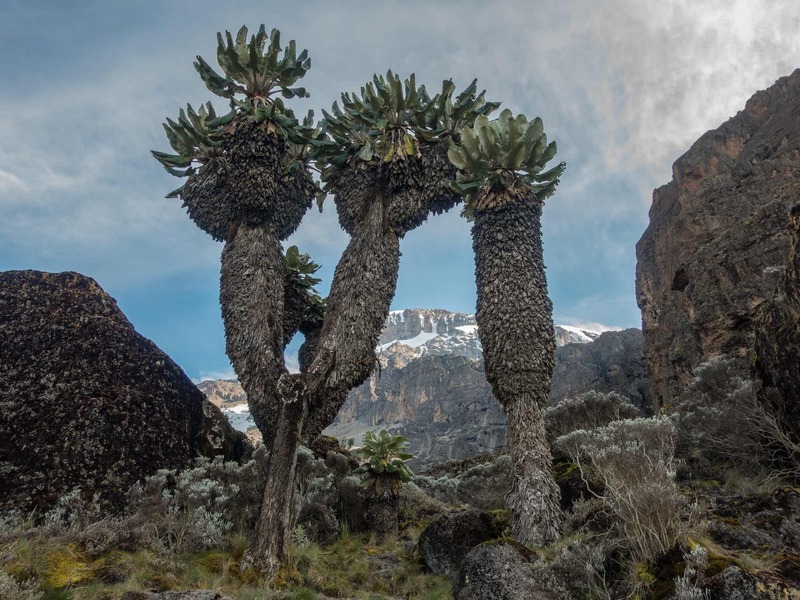 As you stand there on the floor of the ravine you look up at a fairly steep rock wall that will require some scrambling and the occasional hands-on-rock. Mind you, nothing technical and certainly do-able given the existence of an actual trail up the slope and the ready help of one of our guides if we needed it. 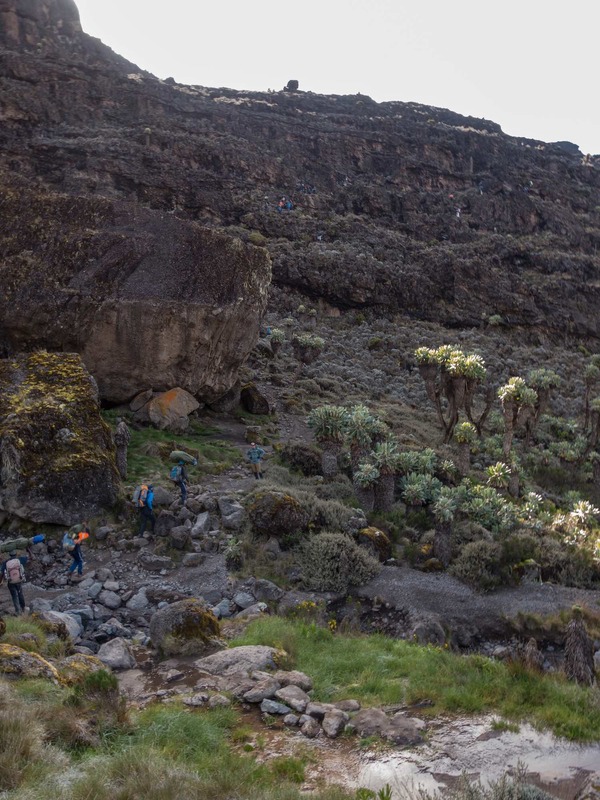 In the image below is the large boulder you walk by as you begin the scramble up Barranco Wall. Also evident are the first of the giant groundsel – Dendrosenecio kilimanjari. They seem to thrive on the east side of the ravine, perhaps because of the shade provided by the wall and the water source running past. I had the feeling I was walking in another world – I thought back to the planet of Pandora on the set of James Cameron’s Avatar! But no – definitely of this world. I just need to get around more! Zoom in on the image and you will see colourful trekker gear at various spots on the Wall. That is your clue as to where the trail is heading! 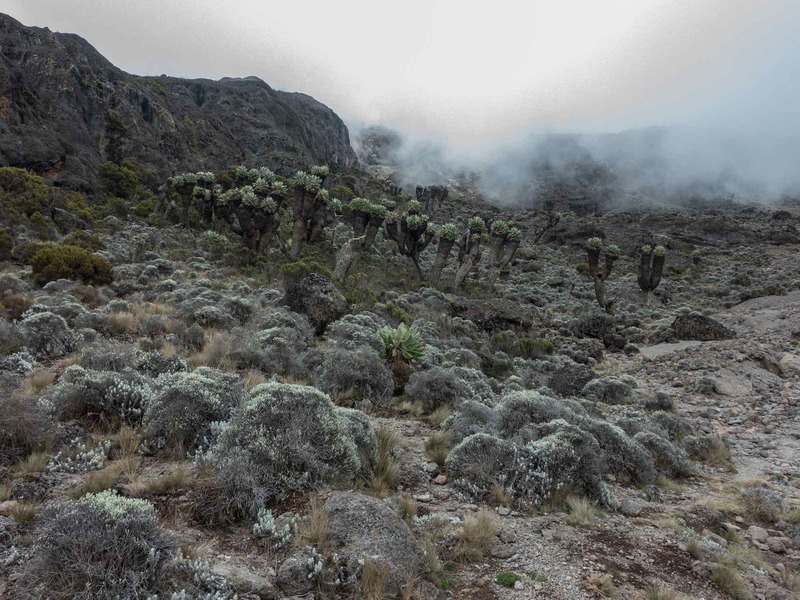 About a third of the way I looked back to our Barranco campsite on the other side of the ravine. And then I focused on some more immediate action: I looked down to see one of our team members was embracing the Kissing Rock on her way across a narrow part of the trail. 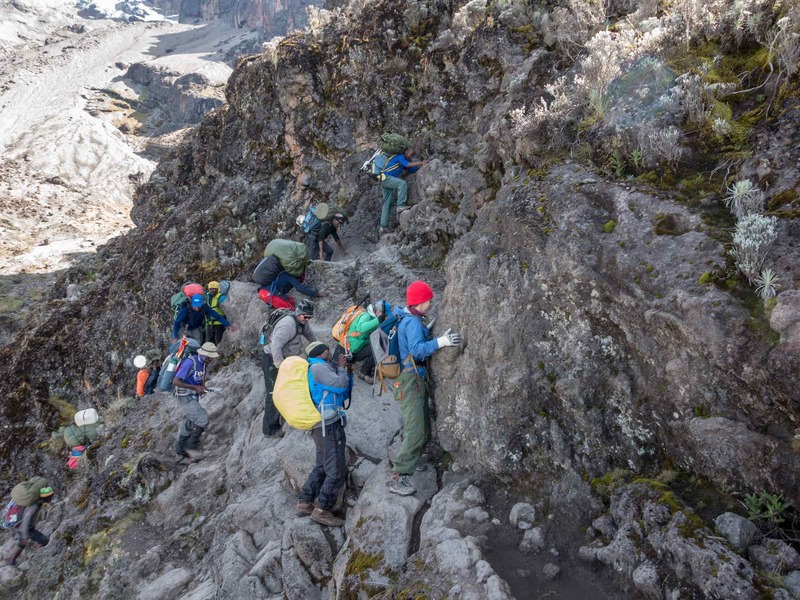 While not in the same league as the line-ups below the Hilary Step on Mount Everest, there were occasional slowdowns as people less confident about their scrambling skills moved cautiously forward and upward. The porters (and there were certainly a few on this stretch!) dodged the trekkers by using secondary trails and sidesteps when necessary. 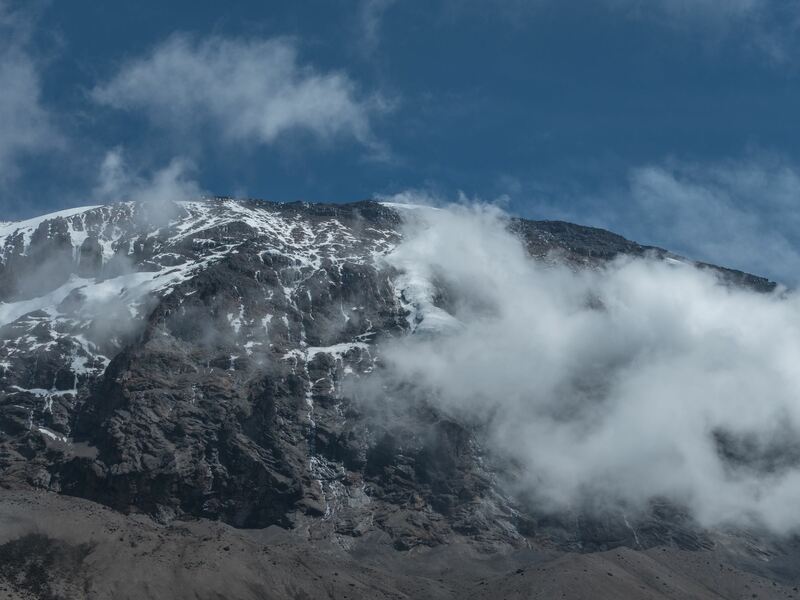 More than once, I celebrated my imminent arrival at the very top – just to be disappointed when yet another ridge higher up appeared when I got there. Here is one such spot – getting closer but not quite there yet! 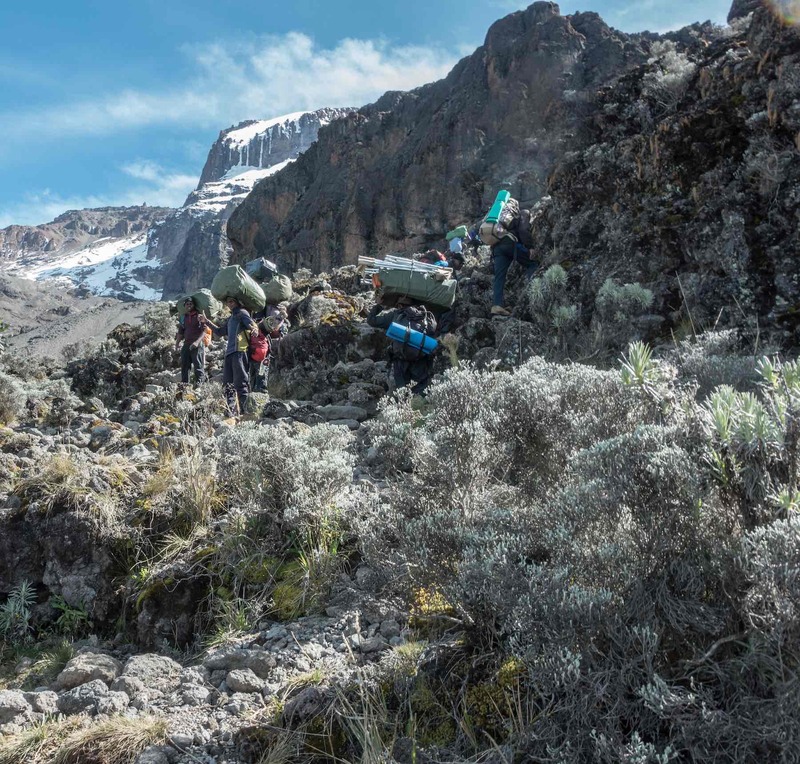 Still – a reason for a brief rest since the worst of the scramble was over, the sun was out, and it was a beautiful day near the top of the Barranco Wall. 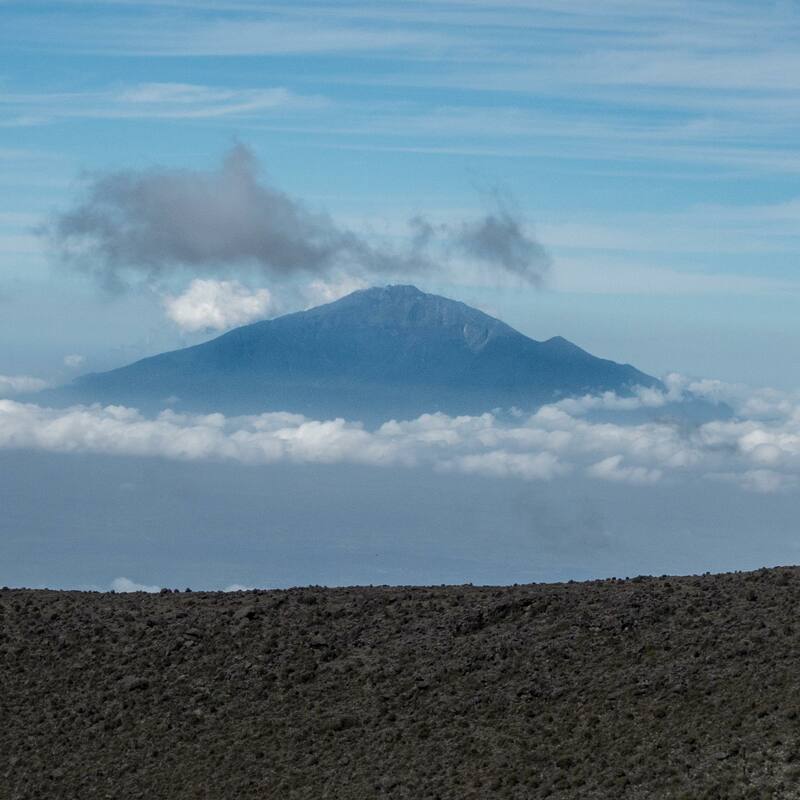 And, of course, some eighty kilometers to the west the profile of Mount Meru! The porters did not stop at our rest stop; they kept on truckin’ up the Wall. As always, seeing their loads move ahead and above us served as route guides for us. Ah, so that’s where the trail goes! Finally, a summit that was not false! 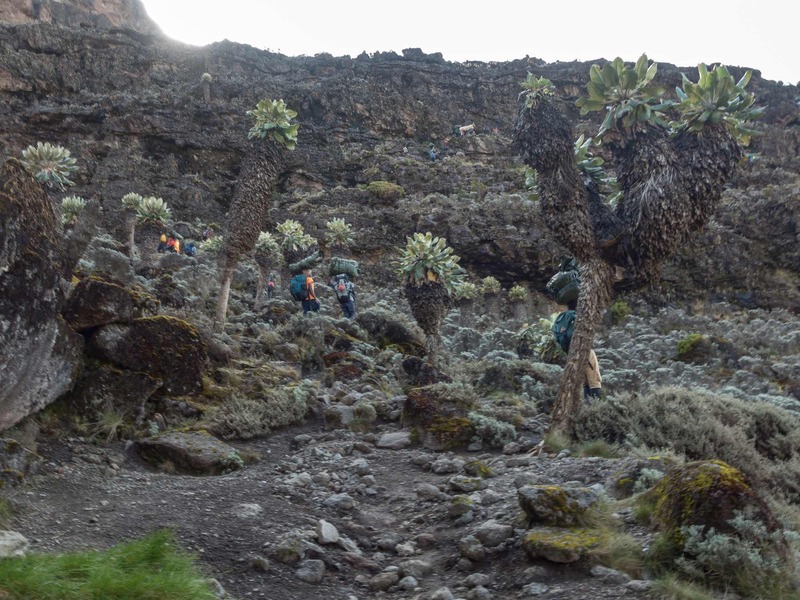 There was almost a party atmosphere when we arrived at the plateau on the top of the Barranco Wall. 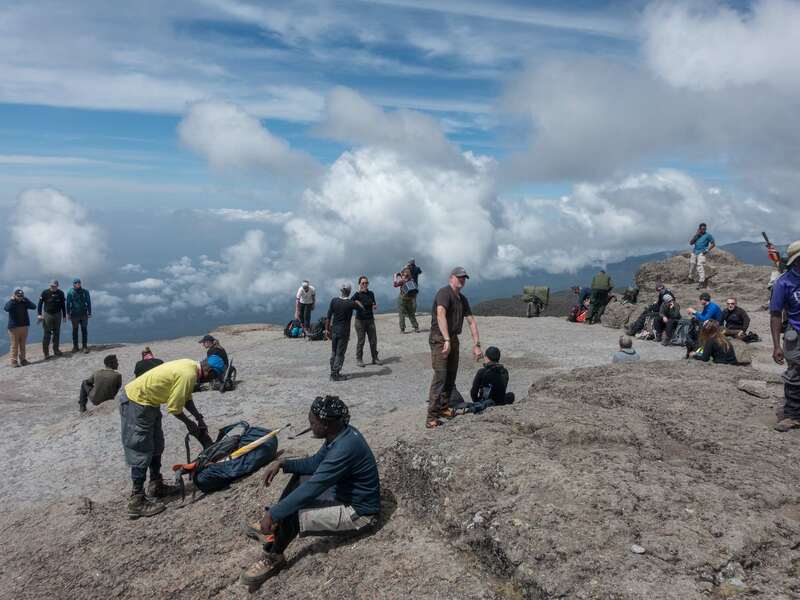 Jackets came off, sunscreen was applied, water bottles and snacks came out of the backpacks, cellphones and more serious cameras were busy snapping photos of team members standing on the edge of the Wall or off Kilimanjaro’s summit to the east. 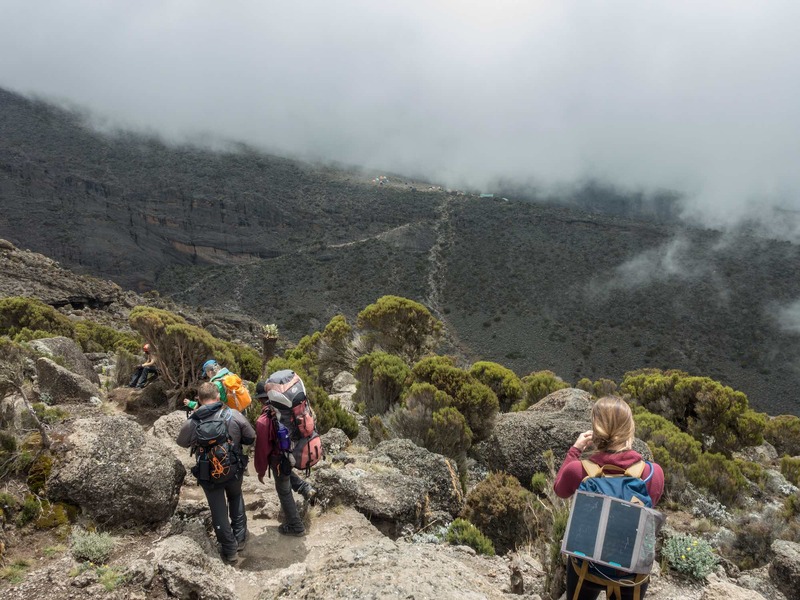 We were 230 meters higher than we had been at Barranco Camp at the start of the day – and maybe 270 from the floor of the ravine by the big boulder and the groundsel. 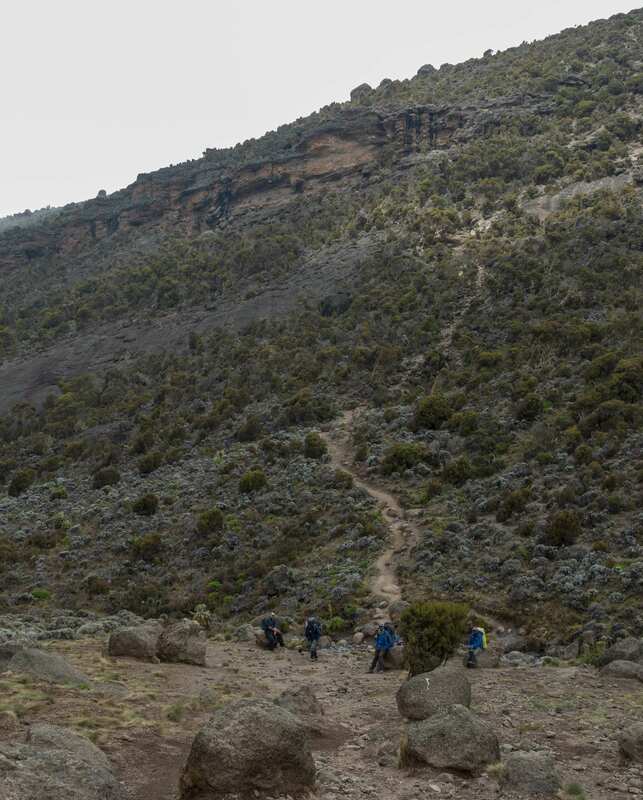 And then it was back on the trail – some easy walking down a gentle slope with mostly desert alpine terrain occasionally hosting those giant groundsels we had seen at the start of the Barranco Wall scramble. 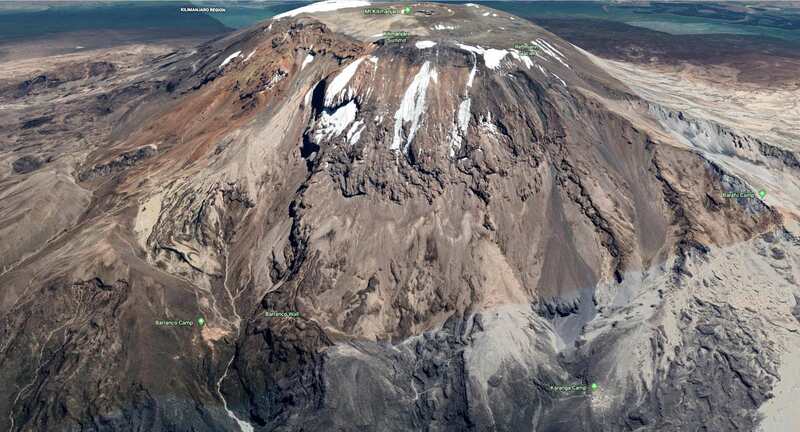 I knew we were almost at Karanga when I walked into the image below. Karanga sits on the top of the ridge in the background. Unfortunately, in between was a steep ravine. 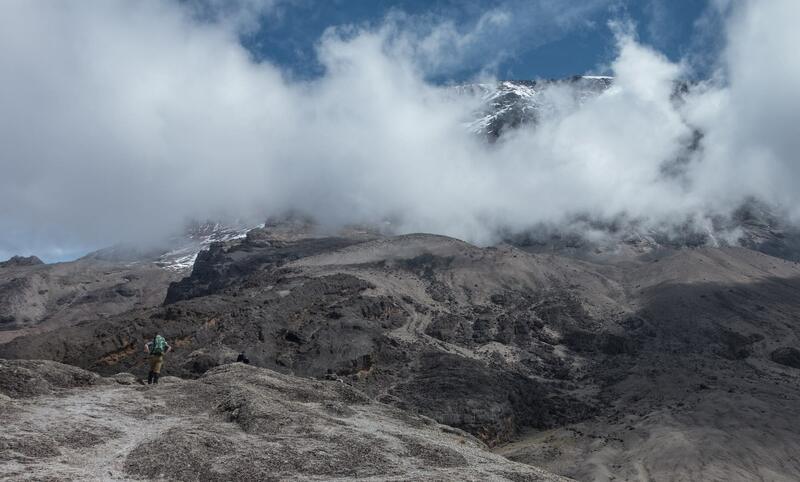 The image below has the floor of the Karanga Valley (3947 m) in the foreground. In the background is the slope we had just scampered down. 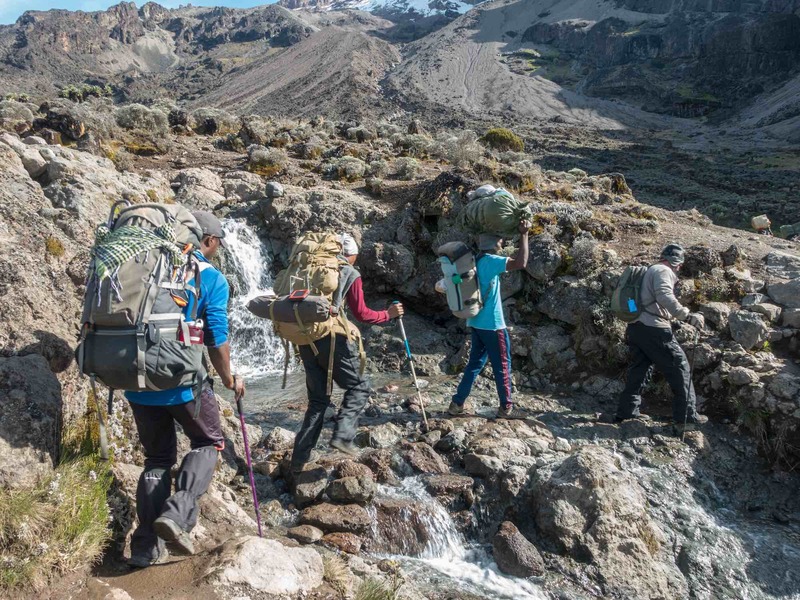 The stream running down the valley is the last source of water for Kilimanjaro trekkers and porters will have to haul it from here back up to the Karanga camp and to the next camp at Barafu (4662 m)! No more pix after we reached the floor of the Karanga Valley. My brain switched into “git ‘er dun” mode and I forgot all about my camera. I just wanted to get up to the top. Later, when I looked at my heart rate record for the day, it was this section up to the campsite that had me pushing myself the most. I hit a maximum of 140. 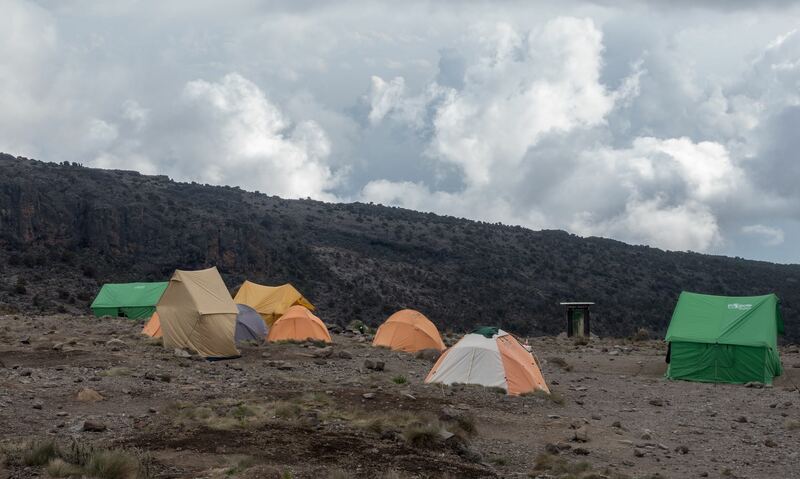 The Karanga campsite is a rather desolate spot on the top of the ridge. 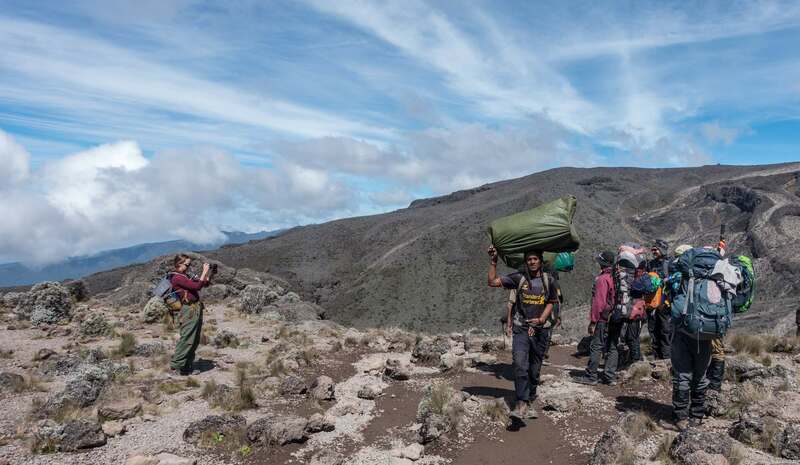 when we got there, as was always the case, our Popote crew had already erected the sleeping tents and put our respective duffel bags in the right tents; the guides’ and crews tents, the dining and the cook tents were also up. and on the left-hand side of our campsite in the photo below you can see our beige toilet tent. We were home for the evening! 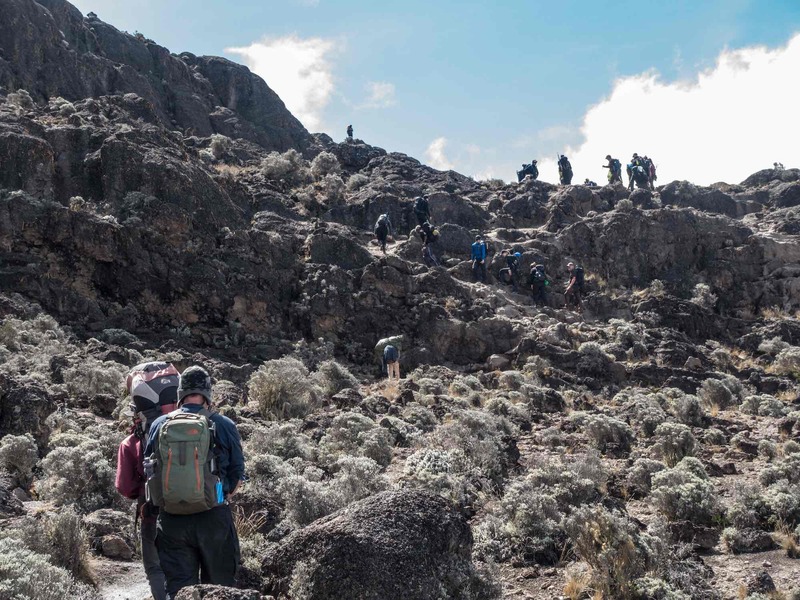 As mentioned above, some trekking groups press on and in another 2 1/2 to 3 hours, arrive at Barafu Camp, the last camp before the summit. In effect, they eliminate one day of the trek. 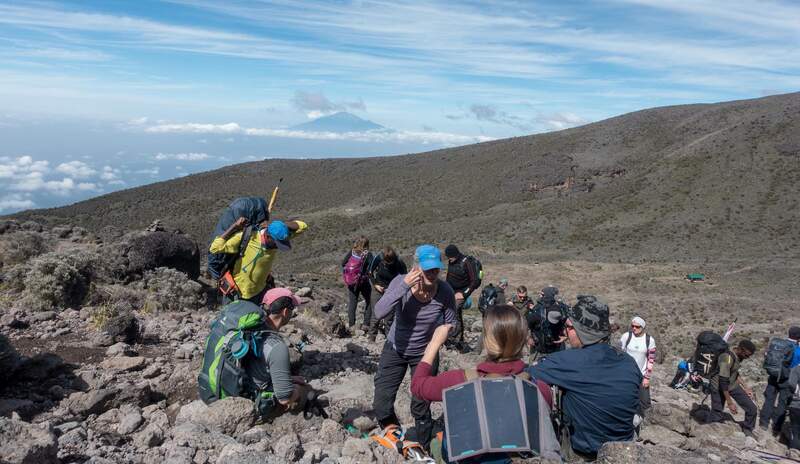 Not only do they have a very demanding day before the summit, but they also arrive at Barafu around 4 or 5 o’clock with the even more demanding summit attempt to start seven hours later. The eight-day Lemosho is an excellent choice. 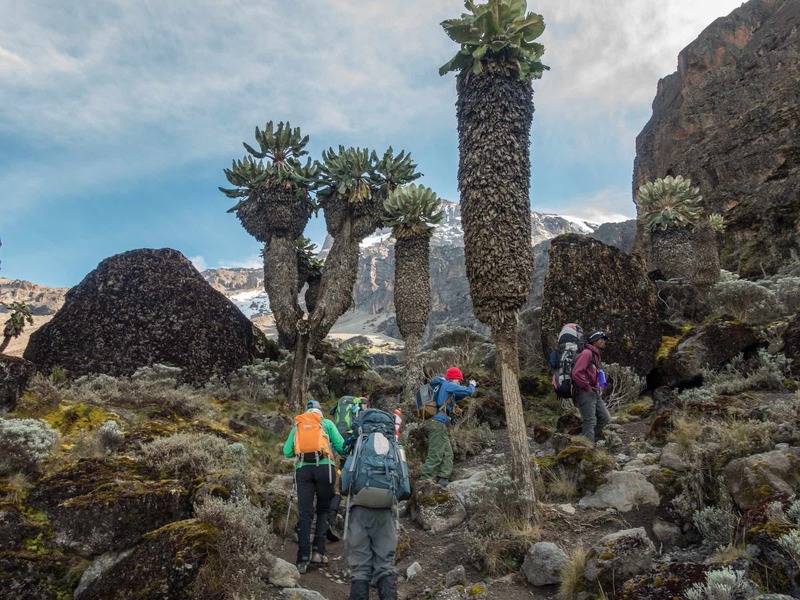 It sets you up at Barafu Camp on Day 6 shortly after noon with lots of time to relax before you crawl out of your tent just before midnight for the single-most demanding day of your trek. 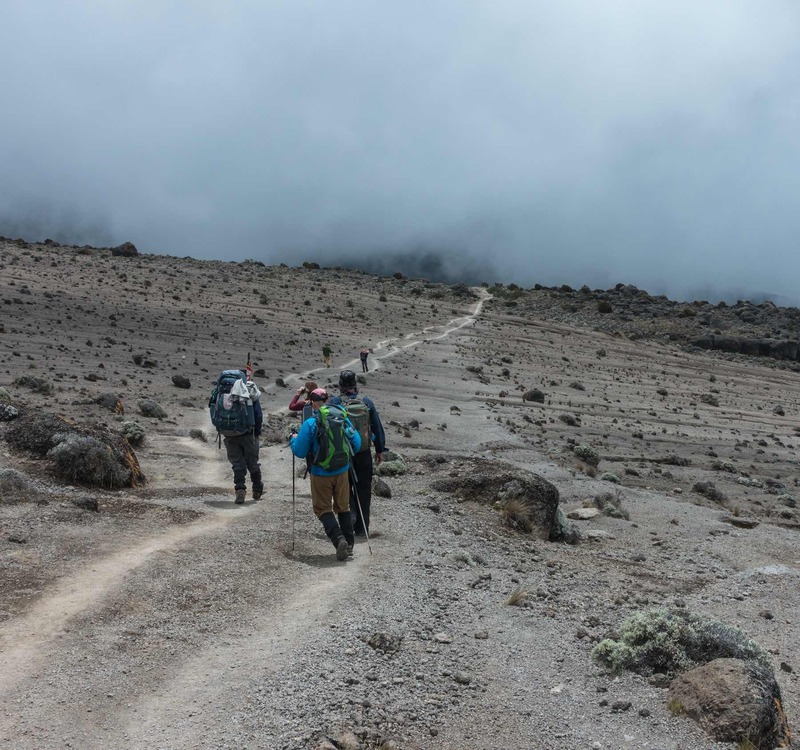 Next Post: Day 6 – Karanga To Barafu.